Chongwe District, Lusaka NE 25km, Kasonde Ranch (Mark Hummel). 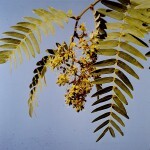 Tree 4−30 m tall; petioles 10−50 mm long, 3−5 times longer than the pulvinus; leaflets in 10−30 pairs. Brummitt, R.K., Chikuni, A.C., Lock, J.M. & Polhill, R.M. (2007). Leguminosae Subfamily Caesalpinioideae Flora Zambesiaca 3(2) Pages 91 - 93. Burrows, J.E. & Willis, C.K. (eds) (2005). Plants of the Nyika Plateau Southern African Botanical Diversity Network Report No. 31 SABONET, Pretoria Page 119. (Includes a picture). Burrows, J.E., Burrows, S.M., Lötter, M.C. & Schmidt, E. (2018). Trees and Shrubs Mozambique Publishing Print Matters (Pty), Cape Town. Page 243. (Includes a picture). Smith, P. & Allen, Q. (2004). Field Guide to the Trees and Shrubs of the Miombo Woodlands Royal Botanic Gardens, Kew ISBN 1 84246 073 0 Pages 100 - 101. (Includes a picture). Hyde, M.A., Wursten, B.T., Ballings, P. & Coates Palgrave, M. (2019). Flora of Mozambique: Species information: Brachystegia longifolia.